EFFECTIVE JANUARY 1, 2017 – WHILE THE HABITAT FOR HUMANITY APPRECIATES ALL THE SUPPORT WE RECEIVED OVER THE YEARS, THIS FUND RAISING ENDEAVOR HAS CEASED. 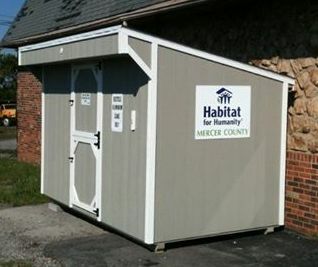 Habitat for Humanity Mercer County collects and recycles aluminum cans. The money from this endeavor goes toward building homes for Habitat partner families. The collection facility is housed in a small gray building with white trim located on the south side of Chilton’s Mulch Center on 127 South. Individuals, churches, service organizations, and businesses can deliver their aluminum cans to this facility. About twice a month, Habitat volunteers collect the cans and transport them to Midstate Recycling Company. The proceeds are used to buy materials and or services needed to build Habitat partner homes. Brenda Eldredge, Habitat Board Member and member of the Fund Raising Committee, is coordinating the pick-up and transport of the cans to the recycling center. Cans are picked up from some of the larger companies in the area, including; Wausau Paper, Toyota Boshoku, Hitachi, and Hobart. Brenda is procuring additional collection materials in hopes of expanding Habitat’s recycling program. More than $2000 can be raised annually when the aluminum can recycling project is run efficiently. We wish to thank Brenda for taking on this important project for the coming year.